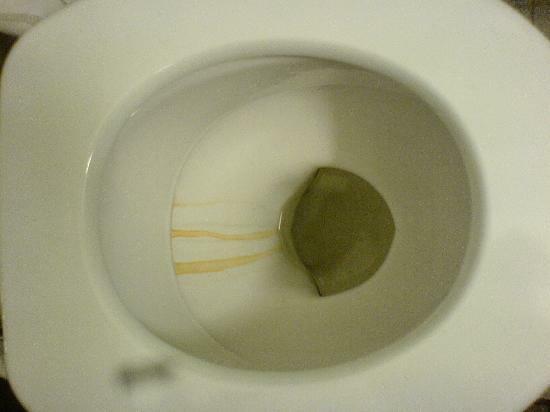 As you can see, there is quite a huge flat area in the toilet that is normally full of water. So every time I take a dump I splash myself with water. Seriously, how can I avoid that? Well I wish you had used a photo of a cleaner European toilet for comparison. What will the Canadians think?! 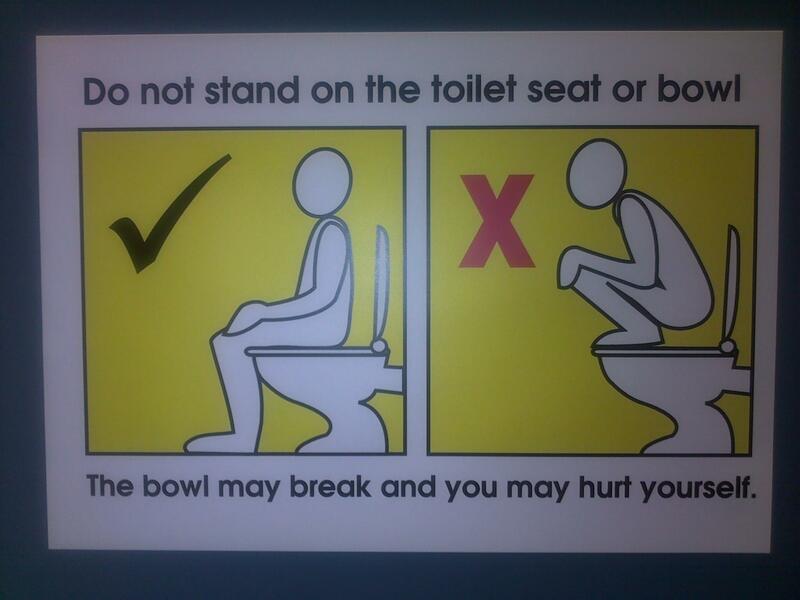 Indeed this is typical of North American toilets. The same applies down in Good Ole USA too. In fact I've seen much higher water levels than this. Man up and take it! 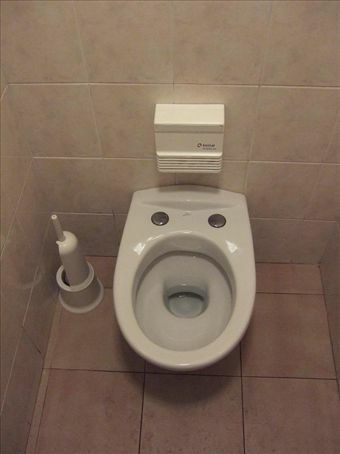 In some places in Europe they have a much crazier thing next to the toilet called a bidet and you don't want to know what that does! Some of the more sensitive people in that part of the world mitigate the problem by creating a layer of toilet paper over the surface of the water before commencement of activities. A gentleman using a low-water toilet can aim at the porcelain to reduce the chance of waking anybody unfortunate enough to be sleeping within earshot. With a high-water toilet there is only the noisy option. High-water toilets seem to have a propensity to overflow. It seems to occur or at least be mentioned in American sitcoms and I've definitely seen it happen at a friend's place in LA, but I've never seen a low-water toilet overflow. High-water toilets, so the justification goes, provide total submersion for unpleasant substances thus reducing the propagation of nasty odours. High-water toilets put on a much more exciting show when flushed. Rather than just "foosh" and it's all over with a low-water toilet, you'll often see the contents of the bowl turn into a whirlpool at an accelerating pace until everything is banished into the abyss with an accompaniment of merry gurgling sounds. OK then...warning, this gets graphic. North American toilets tend to be siphoning toilets - that is, the water-ways in these toilets are designed with slightly smaller diameters than a non-siphoning toilet, so that the water-way will naturally fill up with water, each time it is flushed, thus creating the siphon action. The recognised problem is the splashing that frequently occurs upon load. Due to the increased water, often higher water level, and area and size of wet target when released, the odds are increased dramatically. Aim when possible, for the porcelain, rather than the water. Try to angle where you're not hitting a surface at right angles to the surface, but along it instead. The change in velocity is less dramatic, and it will 'dribble' rather than splash. Experiment with different positions (if sitting) - further forward, further back, perhaps to a side. Final, desperate solution - when in doubt and you need a technological solution, you can always rely on the Japanese to come up with something. I introduce - toilet knee pads! Not the answer you're looking for? Browse other questions tagged canada hygiene north-america or ask your own question. Is the Sudbury Slag Pour still a thing?